Here you will find great home made chocolate cake recipes. Chocolate cakes are one of the best ways to enjoy chocolate. There are so many ways to make chocolate cakes, and so many other ingredients such as lemon, cinnamon or walnuts that you can add to make the cake even better. Nowadays many people make cakes by buying a mix at the store, but nothing can compare to the decadent flavour of a chocolate cake made from scratch. It's not hard at all and your guests or family will love the taste of a home made cake. All you need are a few basic ingredients and a little bit of time. 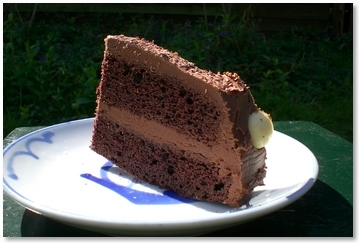 A basic but delicious chocolate cake recipe. Another chocolate cake recipe with just a few more ingredients. This chocolate fig cake is amazing! You probably should not try this recipe if this is your first attempt at making a cake. But if you can master how to make the layers it will be well worth it. Love is the secret ingredient in this recipe. For something a little out of the ordinary. I know what you are thinking - potatoes and chocolate? It works, though. Give it a try if you are feeling a little adventurous. A delicious sponge cake recipe you can make at home. The chocolate will tempt you. Schwartz means black in German. This recipe was brought over to America by German immigrants in the 1800s. One of the best cakes.